Michael Black, our prospective host on Rathlin Island, encouraged us to reach out to his best friend, Pat Good, in Dublin. 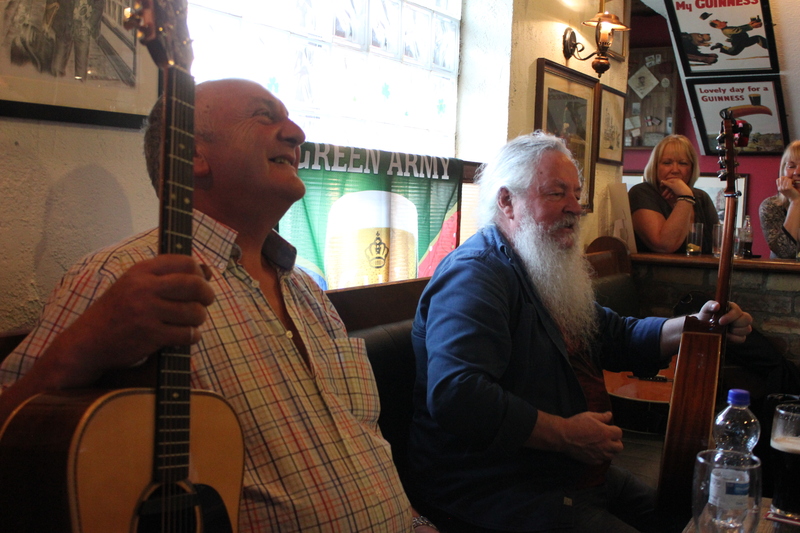 Pat is also a folk singer, who also worked for the Guinness brewery for 37 years. 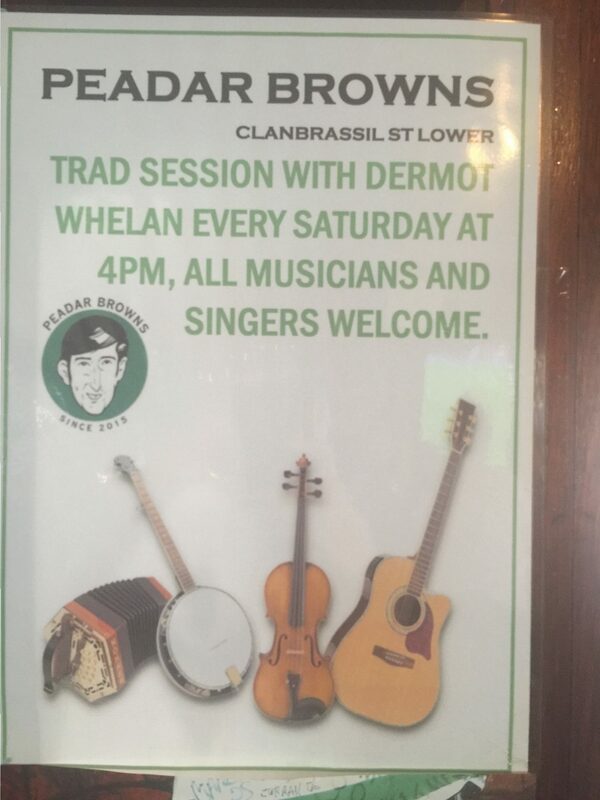 Pat was happy to hear from us to encouraged us to go to the Peadar Brown Pub at 5 pm on Saturday where he would be performing. We had a bit of trouble finding the place as Google seemed not to have heard of it. No online presence. That could be a good thing or a bad thing. It turned out to be a good thing, a very good thing. 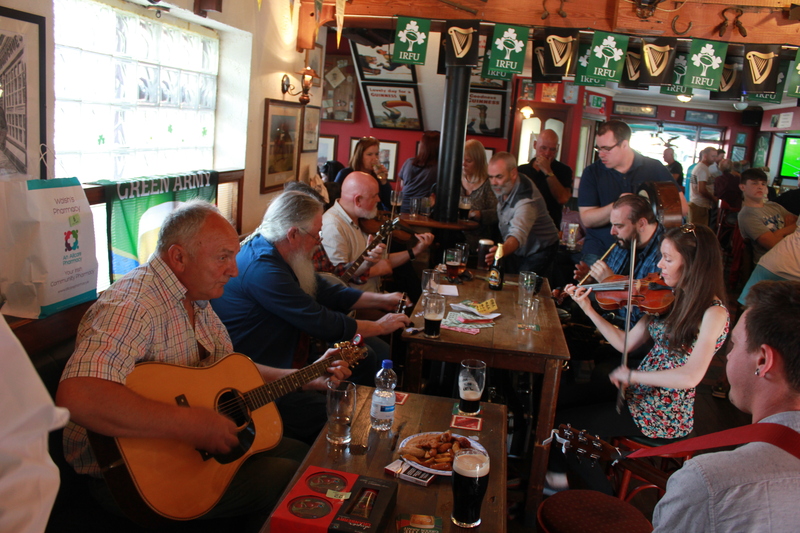 Our three hours at Peadar Brown’s were like entering a mythical Ireland that I didn’t believe really existed. This was a truly local pub in every sense of the term. I knew we weren’t in the kind of bar I’m used to when one of the patrons demanded quiet so they could hear remarks from a representative of the local hospice thanking the bar and its customers for their support. 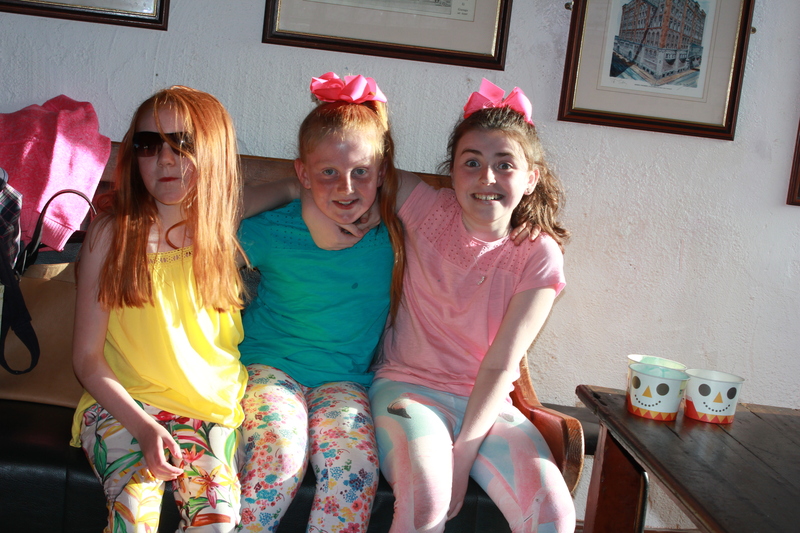 It was also striking to see a group of beautiful young girls of about 10 years old running around the bar like it was a playground. But most of all was the music. It turns out Pat had invited us to a “Trad Session” where musicians, both professional and amateur, are invited to gather to play and sing. In addition to Pat on the guitar, there were 6 or 7 other players. Fiddles, pipes, a banjo, mandolins and a Bodhrán (Irish drum). Patrons of the bar would wander by and ask to sing. The players would play the song of their choice and they would belt it out. This led to the single most Irish moment of my life. Seriously. Probably enhanced by the 5 or 10 pints I had had by then. 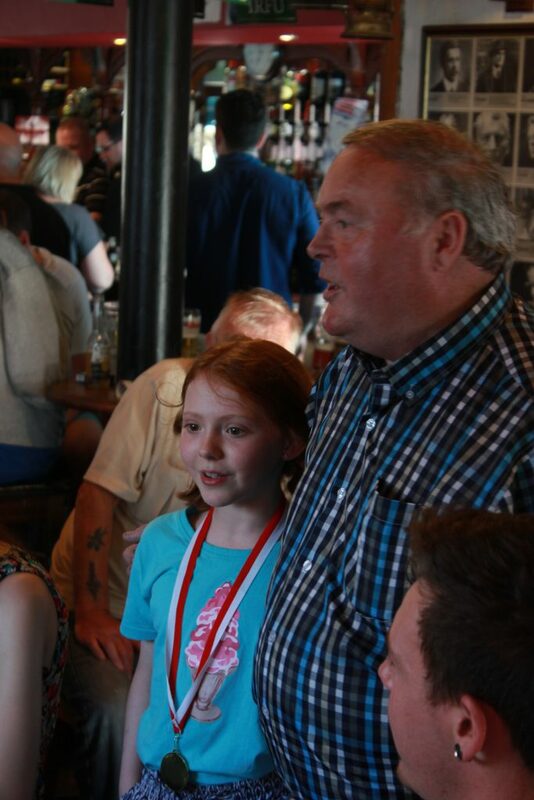 The bar was quieted with the announcement that a grandfather would like to sing a song with his granddaughter. Up stepped a friendly, young looking Irish grandfather with a young red-haired Irish girl who looked like she stepped off a cloud of Irish Angels. Truly stunning. They then sang the song, Grace, which recounts the heart-breaking story of the Irish rebel, Joe Plunkett, who got married in Kilmainham prison the night before he was executed in 1916. Oh. My. God. The sight of that beautiful girl singing that song with her grandfather was almost more than I could bear. A picture is below. I hope to figure out how to post a video soon. In preparation for the trip, Cousin Bob encouraged both Richard and me to be prepared for some kind of performance, since visitors are often required to “stand and deliver” at social events. Sure enough, the leader of the musicians asked for a performance from the three visiting Blacks. I had memorized an Irish blessing by Irish poet/philosopher John O’Donohue called Beannacht. It’s a touching poem that can be found here. Since I was prepared, I didn’t mind going first. Since there was a lot of ambient noise, I figured the stakes were not that high. Who’s going to notice if a screwed up the poem in a noisy bar. So, I stood up. 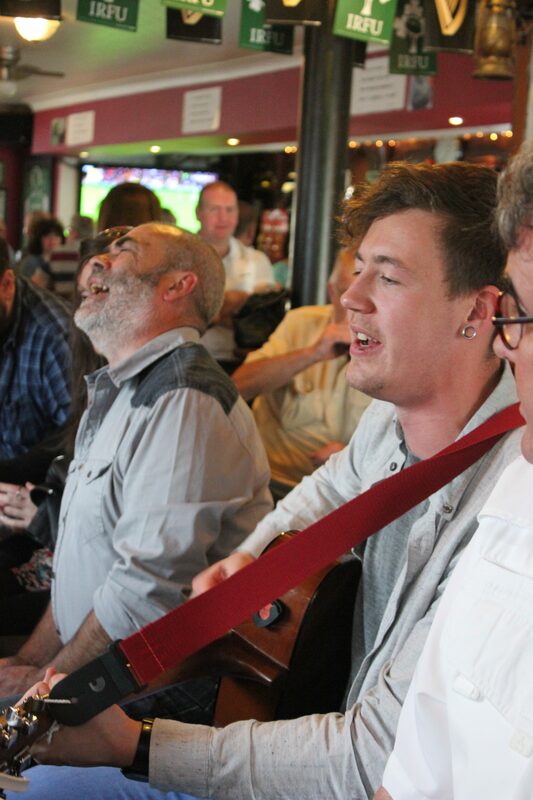 But as I began to speak, the musicians yelled for quiet and the whole bar obeyed. So, everyone was paying rapt attention. That’s when my knees started wobbling. I started off strong, but lost steam as I went along and was making up lines by the end of the poem. But they were kind and got a good round of applause, supplemented, I suspect, with a bit of pity. Of course, I was the first and last of the Blacks to perform. Pictures and video from this amazing evening are below. Be sure to enlarge the pictures to get the full experience. Pat Good is on the far left. The bearded guy next him demanded my performance. David the plumber on the guitar. Didn’t get the other guy’s name but he’s got passion. Are these girls from Central Casting, or what?